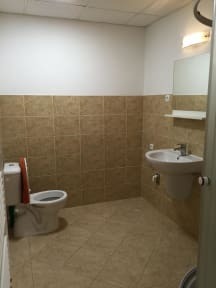 We are situated in a quiet part of city and offer 2,3 and 5 bed rooms with common bathroom and kitchen always for two rooms. Near our guesthouse is a bus stop, shopping centre, restaurant and lake. All rooms are no smoking and with free Wifi. If guests want to come later or at the weekend, they must call to our phone number and we come in 10 minutes for check-in. Or guests can let us know what time did they want to check-in and we wait there for them.